We are finally warming up and feeling like spring here. Nice. This was from a bitter cold day not long ago. 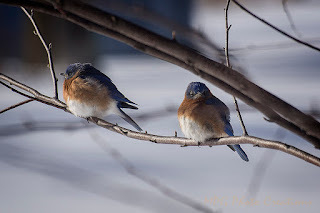 I rarely get Bluebirds but I had a couple who were using the River Birch tree for a place of rest. They did not look happy about the cold and I couldn't blame them as it was windy as well making it worse.